We ensure all of the cars we sell to our customers are in good mechanical order most cars come with a full years MOT. Over the last 15 years we have sold 1000's of good quality used cars to the people of Canterbury and beyond. Should you be looking to sell your used car feel free to get in touch we're interested in most makes and models. 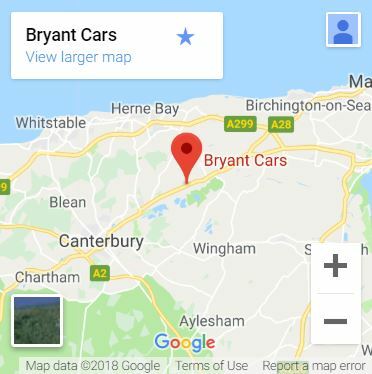 BRYANT CARS QUALITY USED CARS IN CANTERBURY, Kent Bryant Cars are a FRIENDLY, FAMILY RUN BUSINESS supplying GOOD QUALITY SECOND-HAND USED CARS, PEOPLE CARRIERS & VANS. WITH OVER 15 YEARS EXPERIENCE, Bryant Cars specialise in affordable used cars in Canterbury. With New vehicles arriving daily, Bryant Cars have a good range of used cars for you to choose from, feel free to take a look at our latest stock if you can’t see what you are looking for please contact us as new vehicles are arriving daily. At Bryant Cars we specialise in used cars priced under £4000 . Most of our used cars also come with a full 1 Year MOT which is helpful if you are working with a budget but do not wish to compromise quality. We can also arrange warranties on most cars so please just ask, Bryant Cars are Canterburys reliable, affordable used car specialists. Cars Bought For Cash Part Exchange Welcome. Cars and vans WANTED and Part exchange is always welcome, with competitive rates paid, to find out what your car may be worth on a part exchange or straight purchase basis fill out the form on our cars bought for cash page, we will be able to give you a rough idea of your cars value over the phone or by return email. When purchasing a car all major debit and credit card payments are accepted. For the most comprehensive range of low cost used cars in Canterbury, Kent contact Bryant cars today. We are unable to offer warranties on our cars under £1000 but we are always happy to advise or help with any problems should they arise. Take a look at our selection of quality used cars.